If you work in front of a computer all day, you’re familiar with that irritated, fuzzy, and tired feeling your eyes have by the end of the afternoon. Everything starts to get a little blurry and sometimes your head aches. This cluster of symptoms is known as eye strain or computer vision syndrome, and it’s a unique malady of our modern era, one that more than 60% of Americans experience. It doesn’t take long to start experiencing eye strain symptoms — just two hours in front of a screen starts to put people at risk. That amount of time is incredibly easy to hit when you combine computer work, smartphone usage, television, tablets, and other screens. It almost seems inevitable. 1. Enlarge Text – Starting at small can make you squint and put your face closer to a screen, leading to fatigue and headache, among the issues- so boost text size and color contrast to make things easier to read. 2. 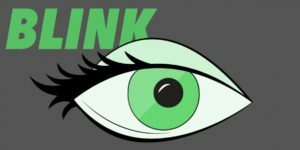 Blink– hen we stare at screens, we forget to blink, which driest out our eyes. It’s hard to remember , but trying to make sure you keep blinking can help . Eye drops are another simple and useful way to keep eyes from getting to dry. B a. What do you usually do if your eye got irritated? b. How many hours do you stay in front of your PC?